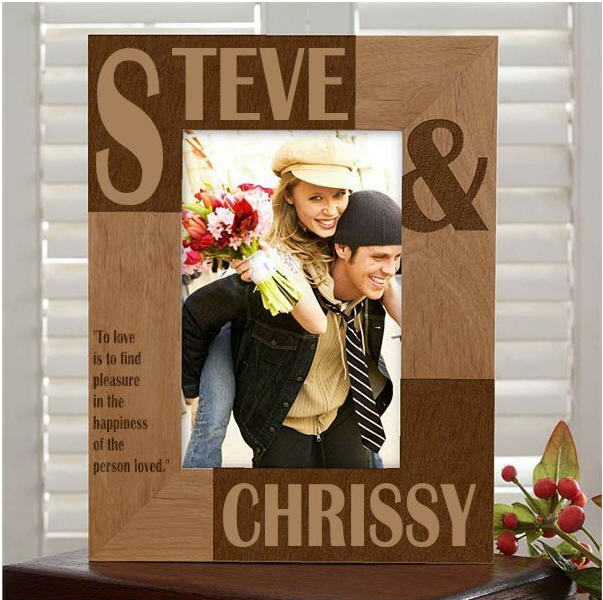 This personalized frame celebrates your love for each other. 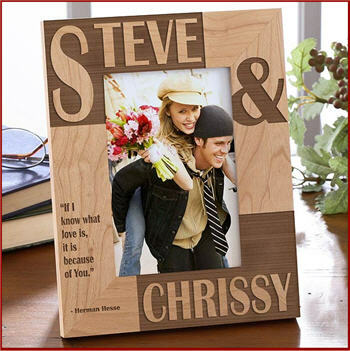 The creative design is delicately laser engraved on a handsome, rich wood frame, then personalized with your first names, for a lasting and memorable keepsake for years to come. Top quality, natural wood frame features easel back design for table top display, or ready for wall mount. Frame measures 8 3/4" x 6 3/4" and holds a 4" x 6" photo. Message on frame reads: "To love is to find pleasure in the happiness of the person loved." Personalization Details: Receiver's first name up to 12 characters will appear in the upper left corner, followed by Sender's first name in the lower right corner - up to 12 characters. Orders placed for this item cannot be cancelled or refunded. Please ensure that the correct spellings for names are entered. Size : Frame measures 8 3/4" x 6 3/4"